Schematic procedure of the EpiQuik™ CRISPR/SaCas9 (S. aureus) Assay ELISA Kit (Colorimetric). 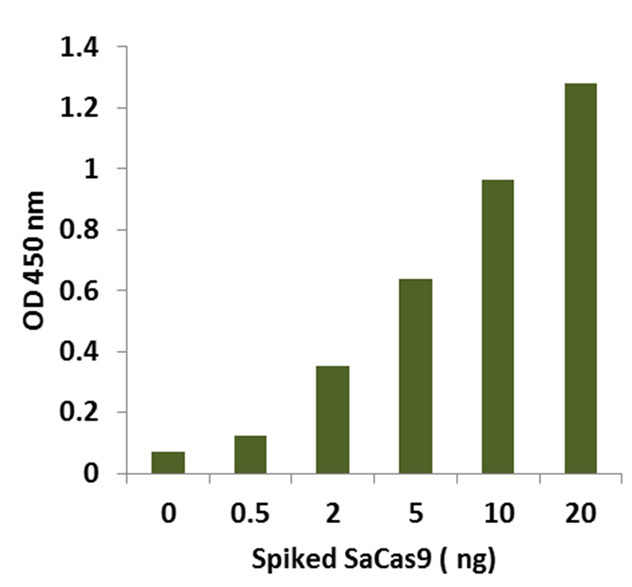 SaCas9 proteins are spiked into 1 ug of K562 cell extracts at the different concentrations. The amount of the SaCas9 proteins was measured using the EpiQuik CRISPR/SaCas9 (S. aureus) Assay ELISA Kit (Colorimetric). Earn up to 609 reward points for this purchase! Innovative colorimetric assay in high throughput format to quantitatively measure Cas9 protein amount without the need for electrophoresis, especially suitable for screening Cas9-transfected clones. High sensitivity and specificity. The detection limit is as low as 0.1 ng/well with dynamic range of 0.5-20 ng/well within the indicated amount range of the whole cell extracts. Only recognizes SaCas9 (S. aureus). The control is conveniently included for the quantification of SaCas9 amount. The discovery of CRISPR (Clustered Regularly Interspaced Short Palindromic Repeats) and Cas9 (CRISPR associated system or CRISPR associated protein 9 nuclease) found in bacteria to work as a defense mechanism against foreign DNA has proven to be an invaluable tool to target and modify a genetic sequence in gene editing and genome engineering applications. The system, known as CRISPR/Cas9, allows for sequence-specific cleavage of a targeted genomic locus by delivering the RNA-guided Cas9 nuclease and appropriate guide RNAs (gRNA) into a cell. In addition, Protospacer Adjacent Motif (PAM) sequence immediately following the specificity sequence is necessary for successful binding of the Cas9 nuclease. It is important and critical to monitor the level of Cas9 editing protein or track the Cas9 editing protein in transfected cells, as it will tell transfection efficiency and optimize the editing process in the total cell population. Staphylococcus aureus Cas9 (SaCas9)-mediated genome editing has been reported in human cells and Arabidopsis. 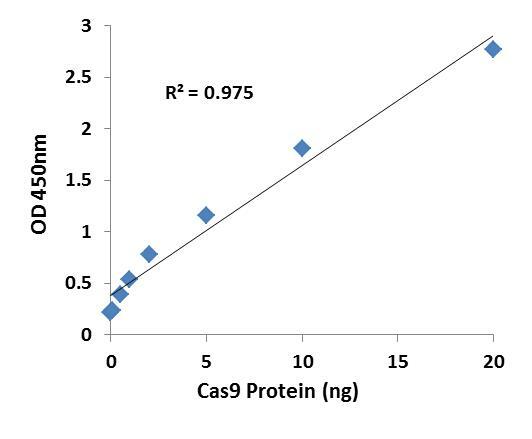 Because SaCas9 (1053 a.a.) is smaller than Streptococcus pyogenes Cas9 (SpCas9) (1368 a.a.), SaCas9 could have substantial advantages for delivering and expressing Cas9 protein, especially using virus vectors. This kit is designed for measuring SaCas9 level in whole cell extracts or purified saCas9 nuclease from various cells and tissues. 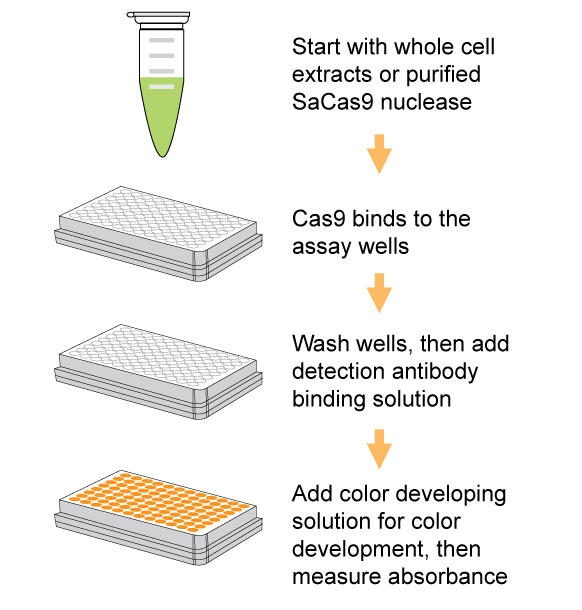 In an assay with this kit, the SaCas9 proteins in samples are tightly and stably spotted on the strip wells. 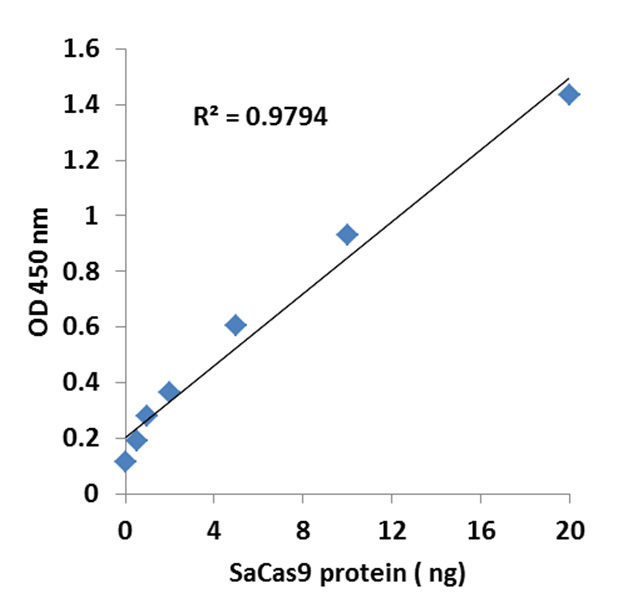 The bound SaCas9 proteins can then be recognized with detection antibody followed by a color development reagent. The ratio of SaCas9 is proportional to the intensity of absorbance. The absolute amount of SaCas9 can be quantitated by comparing it to the SaCas9 control. Input materials should be purified SaCas9 nuclease or whole cell extract. The amount of whole cell extract for each assay can be between 0.5 µg and 5 µg with an optimal range of 1 to 2 µg. Total volume of the input material should not be more than 4 µl. *For maximum recovery of the products, centrifuge the original vial after thawing prior to opening the cap.